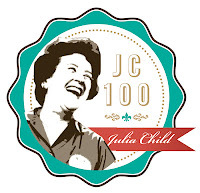 The focus of any great dinner is the main course, and I spent the most time working on this course. I wanted it to be special. I also wanted to show off my cooking skills, and thus commit the sin of pride too! The first thing I thought of in terms of pride was a group of lions. I liked the metaphor, but I was not sure what Loin of Lion would taste like or where I would get some. 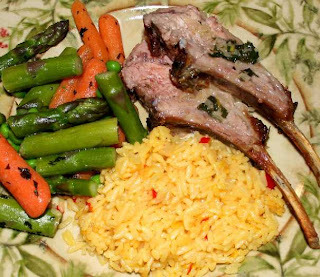 However, Lions are considered the kings of the jungle, so coming up with a Crown Rack of Lamb was a natural step. Plus, "The lion shall lay down with the lamb." Perfect! This lamb was decadent and surprisingly easy to prepare. I paired the roasted lamb with richly colored saffron rice and steamed spring vegetables. A main course fit for a royalty. I was definitely proud to serve it to my guests. 1. Preheat oven to 450°F. Season the lamb with salt and pepper. 2. Mix butter, mustard, salt, pepper and rosemary in bowl. Rub the lamb all over with butter mixture. Place the lamb in roasting pan and set aside for 1/2 hours. 3. Roast the lamb for 15 minutes at 450°F. Reduce the oven temperature to 350°F and continue roasting until thermometer inserted into lamb registers 150°F. for medium, about 45-50 minutes. Because ovens vary, check the temperature of the lamb after 40 minutes. 4. Transfer the lamb to a serving dish, cover it with tin foil and let it rest for 15minutes. Pour off the fat from roasting pan and set pan aside. 5. For the sauce, melt 1 tablespoon butter in large sauce pan over low heat. Add the shallots and rosemary and saute until shallots are tender, about 5 minutes. 6. Add the wine to roasting pan and bring to boil over high heat, scraping up any browned bits. Add the roasting pan mixture to the sauce. 7. Add the chicken stock to the sauce and boil until slightly thickened, about 6 minutes. Add the mustard and mint. Season with salt and pepper. Add the remaining tablespoon of butter to the sauce. 8. To serve, cut the lamb into chops and spoon the sauce over. Serve immediately or keep it warm in a low oven. 2. Melt the butter over medium-low heat in a medium sauce pan. Add the onion, red pepper, and salt. Sweat the onions and peppers until aromatic, stirring constantly. 3. Add the rice to the pan and stir to coat. Continue stirring until the rice smells nutty. Add the saffron chicken broth and bring to a boil. 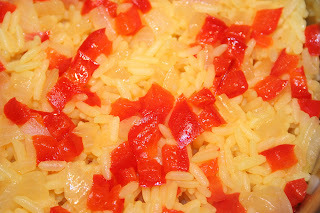 Reduce the temperature to a medium low heat, stir the rice and then cover pan with a lid. 1. Place the carrots in vegetable steamer and steam until carrots are almost tender, about 10 minutes. 2. Add asparagus and steam until crisp-tender, about 5 minutes more. 3. Turn off the heat and add the peas. The peas will warm up quickly from the residual heat. 4. Add the butter and mint to the vegetables. Stir gently until the vegetables are coated with butter and mint. 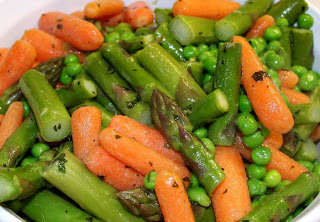 Season the vegetables with salt and pepper. We served this tender lamb with a 2006 Flat Rock Cellars Pinot Noir. A CONFESSION: This confession is my own sin of pride after preparing such a beautiful and delicious course. I was at this dinner and I can easily say this dish was fantastic! 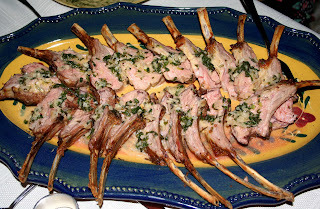 I love lamb and this was even better than my favourite of grilled lamb chops with rosemary and garlic. In fact I'm planning to have it tomorrow for dinner! Peas, rice and wine too! Can't wait.